Pizza, the one food that I think most people who have given up grains miss the most. There are lots of recipes out there for the perfect grain-free pizza, but I think this one beats them all because of it’s simplicity. And it taste JUST LIKE PIZZA! My favorite part of eating pizza has always been the toppings! And this pizza is 99% toppings and a little “crust” at the bottom to told everything together. If you don’t like certain ingredients, omit them and add your favorite pizza toppings! A recipe for the most part is a template so I hope you use this recipe as a guide to make YOUR favorite pizza! I think the next one I do will be with pineapple, bacon & ham! Or even BBQ Chicken Pizza (use chicken instead of sausage and my BBQ Sauce instead of tomatoes.) The possibilities are endless! Don’t want a big Pie?? Simply half all of ingredients and use a round glass baking dish. Eat this warm right out of the oven or enjoy cold as my brother used to do growing up! Enjoy! Oh, don’t forget the ranch dressing! Looking for an egg-free and nut-free version?? Simply omit the “crust,” it will still taste delicious! Preheat oven to 450 degrees F. Lube a 9X13 inch oven safe dish with butter or coconut oil. In a large, heavy bottom frying pan over medium heat, add Italian sausage. Using potato masher (finally a use for that thing), break up sausage into smaller pieces. Add onions, bell peppers, mushrooms and red pepper flakes. Cook over medium heat for 10-12 minutes until sausage is cooked and veggies are tender. Turn heat to low and add garlic, basil, oregano & tomatoes. Stir and taste for salt. Turn off heat. In medium bowl, prepare "crust" by blending all ingredients with whisk until well incorporated. Pour "crust" mixture into bottom of lubed 9X13 dish. Pour sausage and veggie mixture over "crust". Top with most of mozzarella cheese, reserving 1/2 cup. Cover cheese with pepperoni, crumbled bacon, olives, etc. Sprinkle remaining cheese on top. Bake for 20 minutes or until cheese has browned. Allow to stand 5-10 minutes before serving. Top with crushed red pepper flakes and Parmesan cheese if so desired. 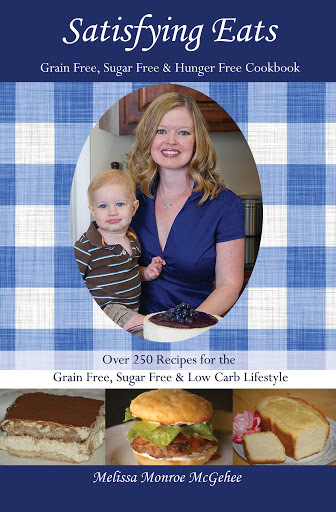 filled with over 250 Grain-Free, Sugar-Free and Low-Carb Recipes! « Easy Elvis Cupcakes (3 Variations)- No special flours needed! where does one get “almond flour”? Eleanor, I always purchase my blanched almond flour from Honeyville. The more you buy, the cheaper it is. They also have other foods such as freeze dried fruits that I use in baking and give my 2 year old as a snack. Here is the link: http://bit.ly/16KaNR2 They also have a sale of 10% off that started today. Simply enter coupon code FOODIE during checkout. ORDER NOW! SALE ENDS ON TUESDAY the 20th of August. @sdheird, glad you tried the pizza. The intent of this "pizza" is to be all about the toppings but you can increase the almond flour to give yourself more of a crust. The little bit of egg is to hold it together a bit. This is defiantly not Pizza Hut crust but hopefully it helps with the pizza craving! 😉 Hope this helps. It sure helped with my craving! Thanks for the fast response! We are all new to this lifestyle and I'm not giving up 🙂 I'm looking forward to trying all of your recipes! Does your cookbook only come in the ebook version????? @Carmen, the cookbook is also available in a spiral bound version. Here is the link: http://astore.amazon.com/satisfyingeat-20/detail/0578116405 Thanks so much! I made this pizza tonight and we loved it! So easy!!! Thank you so much for posting this recipe! I also got your book last night and I can't wait to try the recipes in there! I just made this dish for the first time and it was delicious! My husband is a type 2 diabetic and I am so glad I found your blog! I have ordered your cookbook also! Thank you so much! I have made this dish several times using turkey pepperoni, mushrooms, and broccoli. My husband and I love it! We also purchased your cookbook and have made many of the recipes. Thank you so much for taking the time to create dishes that are low-carb and wheat free. My husband and I, keep returning to this recipe over and over. So easy and delicious! Thank you! We’re trying a slight variation tonight that takes a Tex-Mex swing. We used to love taco pizza, so we’re using taco meat for the meat portion, enchilada sauce for the tomato sauce, toppings of cheddar cheese, green chilis, black olives, and maybe some sliced green onions on top. Thank you!!!!!!! Oh my gosh, the Tex-Mex idea sounds wonderful. I will definitely try that! OMG this is delicious!!!! I made this exactly as listed on your recipe and it exceeded my expectation!!! I don’t even like Italian sausage, green bell pepper, or mushrooms, but LOVED this pizza! My entire family cleaned their plates and let me just say that my kids NEVER have happy plates unless I make one of your recipes! Thank you so much! 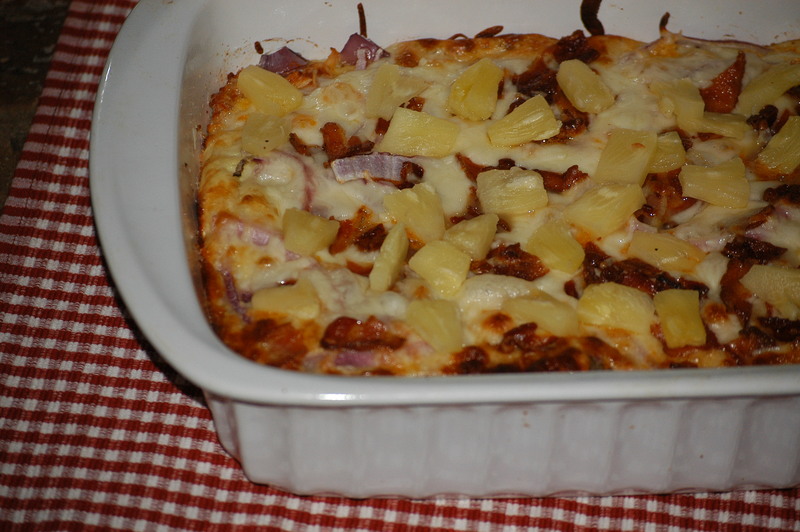 This is an AWSOME pizza…my husband loves it…everyone loves it! We choose this over any take out pizza and it’s soo much better for you! I have your cook book and I am going to get cooking. This is going to be our new way of eating around here. Thank you so much for sharing your recipes! Liz, it looks BEAUTIFUL! Did you half the crust recipe to make it in the cast iron skillet?? Please feel free to share it on my Facebook page….. everyone will want to see this! Glad you enjoyed the recipe and I hope you enjoy the cookbook! 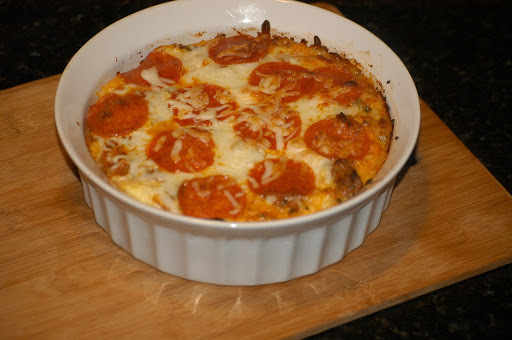 I made this tonight and the taste was great but I would name it ” Pizza Quiche” as the bottom was Very eggy like a quiche. Wondering if adding more almond flour would make it better? I used Bob’s red mill Almond Flour . Any feedback ?????? Gail, you could always add more almond flour or even omit it. Also, try adding 1 less egg. Glad you enjoyed it. The sky is the limit for variations to this recipe! O.M.G.!! 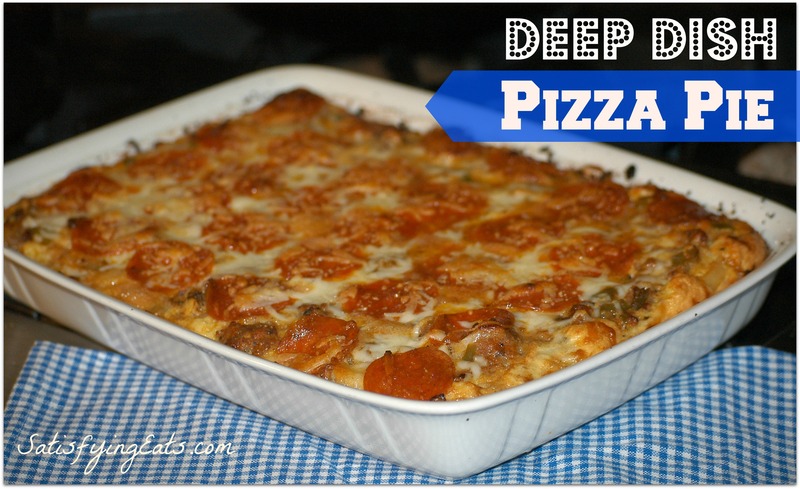 Just made the deep dish pizza tonight – it was wonderful!! Even hubby said to tell you he loved this! After reading the comments, I wanted to be sure it wasn’t too ‘eggy’. So I only used 3 eggs and used 1 cup of almond flour. There wasn’t a lot of ‘crust’ to cover a 9″ x 13″ pan, but it came out great! This really satisfied my Friday night pizza craving! Thanks, Melissa!! Any idea what the nutrition facts are per serving or how many Weight Watchers points per serving on the recipe listed? Nikki, nutrition information will differ based on many things, how lean your meat is, what type of cheese, what type of vegetables you use, etc. The carb count as stated in the post is 4 Net Carbs per serving. If you want to input your exact recipe, you can use this site: http://caloriecount.about.com/cc/recipe_analysis.php I hope this helps! I am happy to see a clean eating blogger who loves ranch dressing as much as I do 🙂 Thanks for your recipes! I see this is a five year old post, but still a great one. The family (me, hubby and teenage son) loved it. I think next time I will drain all liquid from the mixture first, and bake the ‘crust’ for a few minutes before combining everything. Thanks for the recipe!